In one year, Tarrant County College South student James Threats-Jackson expects to earn his associate degree. But he didn’t always seem destined for success in college. “Everyone was telling me that it was vital that I get a college education. I understood what everyone was saying to me, but I didn’t like school,” he said. Still, when he graduated from high school in 2013, Threats-Jackson enrolled at TCC, expecting he could get by in college with little effort. But Threats-Jackson wasn’t willing to put in the extra effort, and vision loss further hindered him in the classroom. Threats-Jackson suffers from Stargardt disease, a juvenile version of macular degeneration. Over time, his central vision will be gone. Already, he has a hard time reading regular-sized print and the glare of overhead projectors, white boards and computer screens makes it hard for him to see. Threats-Jackson didn’t like to tell others about the disease, so he struggled through his courses on his own. Between his vision problems and a general lack of motivation, Threats-Jackson was in serious trouble. Last year, Threats-Jackson found himself on academic suspension. Once again, reality hit. He was ready to take college seriously. Threats-Jackson started slowly, taking one class in summer 2018. He passed the course and enrolled in a few classes that fall. He also sought out Student Accessibility Resources (SAR) for support with his vision loss. The department was able to provide him assistance such as a notetaker and texts with enlarged print. Still, Threats-Jackson was unsure about his path forward and didn’t have a sense of community on campus. One day, however, he had an encounter that changed everything. 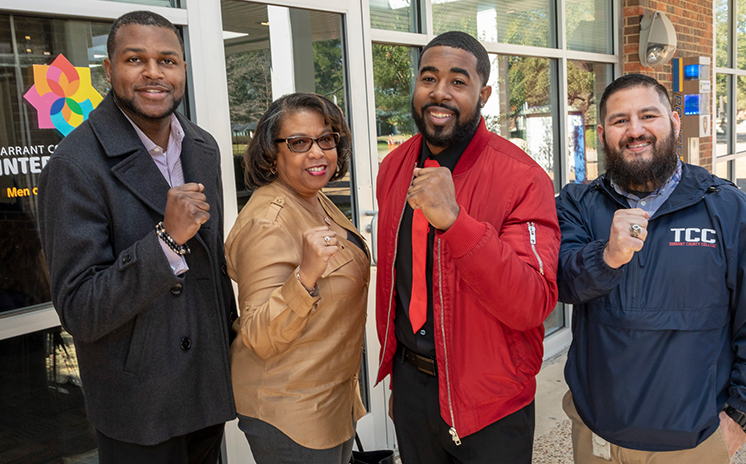 The Men of Color Collaborative (MCC) is an initiative open to all TCC students but specifically designed for African-American and Latino males—who persist in their education and graduate, though at lower rates than other groups of college students nationwide. MCC creates a culture of success at TCC by providing enhanced academic assistance, career guidance, social and emotional support and opportunities for leadership development. “Our goal is to be by their side as they navigate the higher education system and provide them the resources and, oftentimes, the sense of family they need, which is the reason we refer to each other as brothers,” said Perez, coordinator of the Intercultural Network at TCC South. At first, Threats-Jackson dismissed Perez. Perez continued to see him on campus and kept inviting him to be part of MCC. Threats-Jackson told his mom about the group, and she encouraged him to give it a try. Finally, he showed up at an MCC session. The gatherings at TCC South take place twice a week and give brothers an opportunity to have candid conversations and support one another as they work toward their goals. Threats-Jackson quickly realized the value in the group. MCC introduced him to academic and personal resources that helped him stay on track in his classes. Threats-Jackson began taking part in MCC community service activities like Habitat for Humanity, and fellow students and group leaders kept in touch with him, continually checking in and letting him know he wasn’t alone. One of those people is Michael Russ, academic advisor for MCC at TCC South. Russ says taking advantage of MCC services transformed the way Threats-Jackson approaches his classes. Threats-Jackson began attending weekly counseling at TCC South with Cynthia Johnson, sometimes referred to as “Mama Johnson” by MCC brothers. She has helped Threats-Jackson positively reframe the way he thinks and each day sees him applying the skills he has learned in counseling sessions. And now he wants to help others achieve that “I can” outlook. “Brother James has grown from a quiet man who sat in the back during our sessions to now recruiting other brothers to take part in MCC,” said Perez. That’s because the organization has given Threats-Jackson a sense of clarity he never had. For information on joining the Men of Color Collaborative, visit the MCC webpage. This story is the latest in the What’s stopping you? series, celebrating members of the TCC community who don’t let challenges get in their way.